For the Agatha Christie story, see The Regatta Mystery. 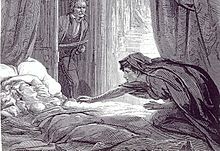 Illustration of Carmilla from The Dark Blue by David Henry Friston, 1872. The stories, which belong to the Gothic horror and mystery genres, are presented as selections from the posthumous papers of the occult detective Dr. Martin Hesselius. An English clergyman named Jennings confides to Hesselius that he is being followed by a demon in the form of an ethereal monkey, invisible to everyone else, which is trying to invade his mind and destroy his life. Hesselius writes letters to a Dutch colleague about the victim's condition, which gets steadily worse with time as the creature steps up its methods, all of which are purely psychological. The title refers to Hesselius' belief that green tea was what unsealed Jennings's "inner eye" and led to the haunting. Emanuel Swedenborg's book Arcana Cœlestia (1749) is cited on the power of demons. A revised version of "The Watcher" (1851). A sea captain, living in Dublin, is stalked by "The Watcher", a strange dwarf who resembles a person from his past. He starts to hear accusatory voices all about him and eventually his fears solidify in the form of a sinister bird, a pet owl owned by his fiancée, Miss Montague. A revised version of "An Account of Some Strange Disturbances in Aungier Street" (1853). A cruel judge in the Court of Common Pleas, Elijah Harbottle, finds himself under attack by vengeful spirits, and in a disturbing dream he is condemned to death by a monstrous doppelgänger. The story is set between 1746 and 1748 and is retold by a Londoner, called Anthony Harman, from the account related in letters by an elderly friend. Not a ghost story but a notable mystery story, in 26 chapters, which includes the theme of premature burial. A naïve young Englishman in France attempts to save a beautiful and mysterious countess from her intolerable situation as the wife of the avaricious and sexagenarian count of St. Alyre; in the denouement it is discovered that the St. Alyres are murderous thieves who have lured the hero, Richard Beckett, into a devious trap. A tale of a female vampire, set in Styria, Austria. This story was to greatly influence Bram Stoker in writing Dracula (1897). It also served as the basis for several works in other media, such as Danish director Carl Theodor Dreyer's film Vampyr (1932), Hammer's film The Vampire Lovers (1970) and Carmilla a Canadian web series starring Natasha Negovanlis and Elise Bauman and also directed by Spencer Maybee.